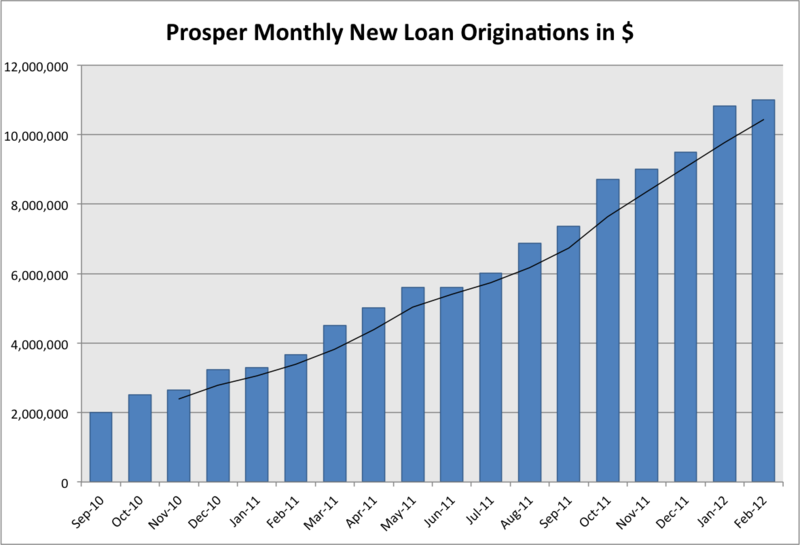 As we have come to expect now every month, February was a record month for U.S. p2p lenders Lending Club and Prosper. Around $47.1 million in new loans were originated between the two companies, over $2.2 million higher than last month. It was a very strong month for Lending Club. They started out the month with a bang, issuing around $10 million in new loans in just the first two days alone as they roared past $500 million in new loans since they began in 2007. It seems that the big end of month rush that I have written about several times in the past has now switched to the beginning on the month. Lending Club has some control over this because they have a ton of institutional money that they put to work through LC Advisors as well as through individual PRIME accounts. I was also told that they had a big new investor come on board last month who wanted to invest themselves through the retail platform. 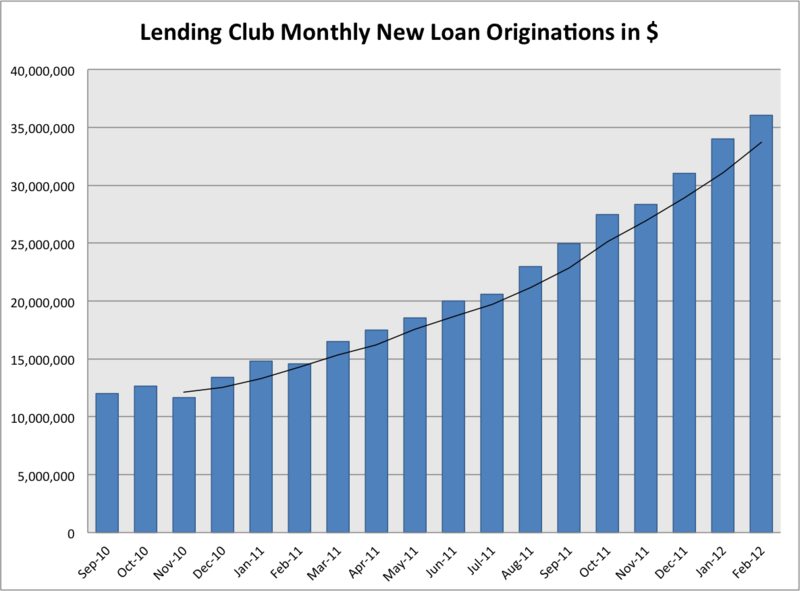 The chart for loan originations at Lending Club over the last 18 months is below. Ever since February 2011 the numbers have moved straight up. The black line is the three month moving average. Prosper had another strong month keeping their growth run alive – they have now had positive new loan growth for 17 straight months. They came in at a hair over $11 million and up just $175,000 from last month. In February of 2011 Prosper did just $3.7 million in new loans so they continue to demonstrate tremendous growth year over year. When I interviewed Prosper’s EVP of Risk Management Jim Catlin back in February last year he indicated that fast growth was coming. It seemed unlikely at the time because their volume had shown only moderate growth over the previous 12 months. But since then Prosper’s growth has really accelerated. In many ways this is thanks to Worth-blanket2, Prosper’s biggest institutional investor, who lead the way again this month with $3 million invested according to Lendstats, bringing their total investment now to over $20 million. The other big new institutional player, Index_Plus, continued where they left off last month and invested $2.3 million. So, Prosper’s top two institutional investors accounted for around 49% of the loan volume this month. Based on my research the only other investor who kicked in more than $100,000 in February is another new institutional investor (this one out of New York) that goes by the name of P2P_Investor. Clearly, the institutional investors are well over 50% of Prosper’s business now. Here is Prosper’s 18-month loan chart. I wish LC would provide similar data as Prosper does in terms of who their biggest individual investors are. Its very interesting to see that 2 people/companies basically are doing half the funding on Prosper. I wonder what the # would be for LC. So…any projections from either about when they will start seeing profits. I know LC is focusing on growth at this point, and is trying to capture as large a share of the p2p lending market as possible, but I’d really like to know what their time-frames are to when the companies are in the black. @Danny, Lending Club keep this information quiet. I have heard they now have multiple investors who have at least $10 million invested but no idea exactly how much. My guess is that no one investor has much more than 10% of LC’s monthly volume. @Roy, When I last spoke with Lending Club they seemed to be in no hurry to turn a profit. I keep telling them that I think being profitable would be a good strategic decision, if nothing else, because it would give investors more confidence. I still think Q4 they will be very close to break even but real profitability probably won’t come until 2013. Prosper will probably take a bit longer although I would be very surprised if they are not also profitable by the end of 2013. Mike- Thats exactly my worry, and exactly why I havent opened an account with Prosper. Though who knows if LC may have a similar situation. I have no data to back this up, but my gut feeling is that LC probably has a number of heavy hitters at the top, but has many smaller accounts at the bottom. I don’t get the vibe that one or two huge investors are gobbling up loans shortly after they are listed. You can determine how many people have invested in a particular loan on LC, and usually that number is over 100, unless it is a very small loan. However, Peter has shown elsewhere on this blog that relying on one’s instincts can be hazardous to your investing health. Mike…….On the other hand there are plenty of highly successful businesses who depend on 2 or 3 big fish, in fact there are even some who depend on one big fish for almost all their business……………the federal government. Whether it’s an asset, liability or a bit of both depends on many factors. Prosper 1.6% growth, month over month. Feb only had 29 days in it but…. @Mike, I have never seen a case on Lending Club where a loan is gobbled up in less than a day. In fact it is exceedingly rare to see a loan on their platform that is more than 50% funded after 24 hours. This is primarily because they control most of the institutional money themselves whereas at Prosper the big investors do there own investing. @Danny, I don’t see it as a big worry. What worries me more about Prosper is that while their institutional business is growing rapidly, the small retail investor doesn’t seem to growing as fast. It seems that most new individual p2p investors prefer signing up with Lending Club than Prosper. I don’t know the reasons behind that but it could be simply because LC is the big fish in the pond now and therefore seems a better bet. @Dan, While there are many successful businesses with just one or two big clients I think most of us would like to see a much broader mix of big investors at Prosper. @Charlie, Well it will be interesting to see how March goes with two more days than February. They should be over $12 million. Peter………You mean a broader mix of big & small investors. Peter, are you worried that either one of or both of Lending Club and Prosper will close to either new investors or the non-accredited investors at some point and just focus on the institutional side? I haven’t done research on this, there may be several institutional only P2P markets now that I just don’t know of. 2) LC investors seem much more likely to be sharing their stories and their information on blogs. This may be due to the fact that there are more individual investors already on LC, but word of mouth is powerful. It seems more people are posting about LC which leads to more LC investors which leads to more people posting about LC, ad nauseam. 4) LC seems to be doing a better job of marketing. This is purely the impression I got when I was researching late 2010. I’m not sure whether it is really true. But Lending Club seems to have the name recognition that Prosper does not. And, “Lending Club” is more descriptive of the business model than “Prosper” is. Of course, there are probably other smaller reasons, like Prosper 1.0, but I feel that the above top 5 list sums it up. A closer look at the numbers shows that although Lending Club set another record for volume, it didn’t set a new record for the number of new loans originated. Therefore average loan size was up……….. to a shade over $14k. Please correct me if I’m wrong, but I believe that number is or is very near to an all time high. Despite Peter’s recent article about large loans, that $14k number is one that I’d want to plateau now & will be keeping a close eye on going forward. @CultofMoney, There are plenty of options for large institutional investors to participate in consumer credit. I have never worked on Wall Street so I don’t know all the ins and outs of this but hedge funds and other large institutions have been buying up consumer credit card debt for decades. So the really big investors have options. @Roy, You are probably right. When they launched there were a ton of bloggers eagerly following Prosper’s every move and then three years later none of them were writing about Prosper any more. They certainly have more bad press out there than Lending Club because of the bad returns of many investors in Prosper 1.0. @Dan, Yes, I meant to mention the larger average loan size. When I look back over my data that goes back to January 2010 the average loan size of $14,196 was indeed the largest average loan size ever. Like you, I am hoping this plateaus for now and stays below $15K at least until we have some more history in for these larger loans. @Peter, I think that it was also that the majority of people who first saw p2p lending as a great investment opportunity started with Prosper. After suffering large losses, they probably got jaded by Prosper, and once there was another alternative (i.e. LC) those same people crossed over to LC. So, in my opinion LC attracted all the disaffected Prosper lenders who were the ones who saw the potential of the p2p lending industry at its infancy. Now Prosper and LC are having to convince those who may not see the potential or who are not as open to the idea. But while Prosper is left having to build a base of customers, LC has a strong (and, in my opinion more vocal) base and are thereby directing friends, family and blog readers to LC rather than Prosper. This generates a lot of referrals and free advertising for LC that Prosper just does not have. On a side note, the reason I chose to start with Prosper was for the same reason I think a lot of people may make for going with LC: Prosper 1.0. I stood back on the sidelines during the Prosper 1.0 era, cautious but optimistic. When I went back and took a look in 2010, I saw that a lot of things had changed, including the actual returns. So not only were Prosper’s returns higher, but they also had much more data behind their models and hopefully more overall experience (and learning opportunities) from their initial start, even though LC exited from their quiet period a lot sooner. A year later, though, Prosper is still playing catch-up in terms of loan volume, and LC probably has the richer data set, but I think both have good UW models. So it all comes down to word of mouth, name recognition, and their reputation/goodwill. And I believe LC is focused on becoming the leader, hence the reason why they are in no hurry to show a profit–they are more concerned about gaining as large a share of the overall p2p lending market. @Roy, Lending Club is trying to make hay while the sun shines. They are in a fantastic position. A ton of cash in the bank, the biggest player, a large number of investors that is making fast growth seem easy, seemingly able to add borrowers at will and all this with the backdrop of a unique interest rate environment. No wonder the VC’s want LC focusing on growth. They are looking five years down the road and eyeing an IPO where they will get 100x on their investment. Peter………I guess I’ll fulfill the role of “fair & balanced” once again. I fear that your analysis contains more than a small dose of wishful thinking. I’d hardly suggest that Lending Club is “seemingly able to add borrowers at will”. Otherwise they would have blown through their total loan numbers this last month…………..which despite volume, they did not. Secondly, we should not confuse euphoria & potential IPO fever with long term health………….or need we go through the list of successful IPOs that led to nowhere. But more importantly, I think we’re over emphasizing the importance of market share in this type of business. In a 2 company game where both companies combined aren’t even scratching the surface in terms of potential business, this is hardly a zero sum game at this early point. Market share can be fleeting, especially in a business model where 85-90% of the revenue comes from NEW loan originations, from by & large NEW borrowers which require by and large NEW investor money. It’s a real balancing act to say the least. The other problem going forward has always been interest rates. I posed the question 2 years ago directly to Lending Club & the same question remains today. Where will new investor money come from when 4-5% 3-5 year CDs are available & Lending Club is returning 6% long term to the “average” investor? There was no answer 2 yrs. ago & I don’t see anyone offering one today either. As much as I hate the comparison, it is one that will continue to be made. And for those who think that 6% isn’t truly what the average investor at Lending Club is receiving, please think again because it truly is. I do know that eventually money will go to where the returns are. Who knows, maybe if Prosper continues providing the type of returns that they’ve been providing the last few years new investor money will pour into them in the not too distant future. None of this is to suggest that VCs won’t at some point line their pockets with gold. But I think it’s important not to make grand statements & project too far into the future. The game is still in the VERY early stages here. @Dan, The scenario of 4-5% interest rates on FDIC insured deposits is the only thing that I believe can stop this rapid growth of p2p lending. But in the current environment I find it difficult not to be optimistic about the future of LC and Prosper. The facts are this: Lending Club and Prosper are growing at well over 100% annually. They are providing good returns for most investors and whether you define good as 6% or 9% it is still a good return when compared to most other asset classes. I don’t know what will happen when returns from money market accounts and CD’s hit 5%. But it is not a stretch to believe there will not be much investor interest if returns are at 6%. So, I completely agree that is a stumbling block for the future. I expect by then p2p lending will be far more mature with both LC and Prosper solidly in the black and the underwriting even more refined than today. So there will be less of a risk premium demanded. Investors will certainly want more than 1% but I think if they can establish an average return in the 8-9% range and CD’s are at 5% I see plenty of investor interest. It may be harder to get the 100% year over year growth but I don’t think investors will be leaving in droves. @Peter/Dan, Maybe I am missing something, but the reason I see for the interest rate on CD’s, money market accounts and savings accounts is that banks are charging higher interest rates themselves. The result would be an increase in the interest rates for Prosper and LC borrowers as well. Since Prosper and LC are already offering high returns to investors, I would like to see an increase in interest rates. My hopes would be that the Prosper and LC would not have to raise borrower interest rates as much as the interest rates banks would need to charge, and the p2p lending industry can start to really undercut the banks and grab a larger share of the market. According to bank rate, the national high CD rate for a 3 year CD is 1.5%. Rates would need to jump 3.5% to get to 5%. A 1.5 – 2% increase over the 2011 ROI Lendstats is showing for both would still double the return of a CD. I’m sure Prosper and LC are still improving the UW, and with a higher interest rates all around, I would think that they would not need to raise borrower interest rates as much as banks would need to in order to achieve a 3.5% interest rate. Of course, it is difficult to know how great the interest rate environment impacts investor returns for both CD rates and p2p lending returns. Propser and LC have the advantage of having no B&M branches, but banks offer a lot more services and make a lot of money on the fees they assess. While I am optimistic about any increase in interest rates (not knowing about the financial aspects of banks), you two might be right in fearing a higher rate environment. @Roy, If most borrowers were deciding whether to take out a bank loan or a p2p loan then I think your point is valid. However, from what I can see most borrowers are comparing rates they can get with a new credit card to their p2p loan rate. Credit card rates have not come down, in fact they have been at record highs recently. In a rising interest rate environment it is hard to see these CC rates going much higher, so I think LC and Prosper will be limited in how much of the increase they could pass on to borrowers. Of course, we are all speculating and no one really knows what would happen if and when rates go to 5%. But as I said above, I think by then p2p lending will be a far more mature asset class. I would like to see loan volume increase in March to make up for the decline in Feb. Over and above the fact that Feb was a 29 day month. They make there money on originations. Less loans with a higher average $ is not a good thing. Charlie………Right now, not surprisingly, there’s plenty of investor cash. My guesstimate is that both companies could easily be doing 50% more volume than they’re doing if the borrower demand was there. So I have no doubt that you will see a continued increase in volume & originations going forward. Peter………We are pretty much in agreement. Realistically, I don’t see interest rates going up in the next few years, but when it eventually does I think people will be surprised at how rapidly it’ll move. Until then I suspect that borrower demand will be the overriding factor in regards to growth.